Understanding video cables is easy with this basic guide. Understanding basic video cables just requires a quick tutorial. Here are some tips and resources to help get your new electronics or home theater system hooked up in a jiffy. S-Video is short for "separated-video". It is superior to composite video cable. 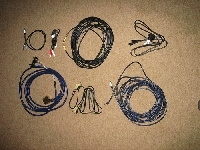 Component video cable utilizes a three-jack cluster of wires. It is color coded green, blue, and red. This cable helps simplify video electronics and helps to reduce the overall bandwidth. Composite video is the standard "AV" connector of yesteryear. It is color coded yellow. Unless you are working with some older model equipment, you probably will not need this cable. Ask at your local electronics store, or shop for electronics online to find any of these parts. You may need to find a specialty electronics store to find the items you need at the best prices. With most electronics, all you will need are the video cables, but sometimes you may need special tools, such as pliers or screw drivers. If all else fails, consult your service manual (yes, the same manual that came with your new products and which nobody ever wants to read.) If you have consulted the manual along with the guides above, but you are still at your wits end, simply do what most people who just can't figure out basic video cables do: call a technical-minded friend to hook your stuff up for you.